Based on Dardano Saccehetti’s seemingly endless output (he wrote three other films in 1983! ), it is understandable if you thought you’ve already seen five or six other movies exactly like this one. 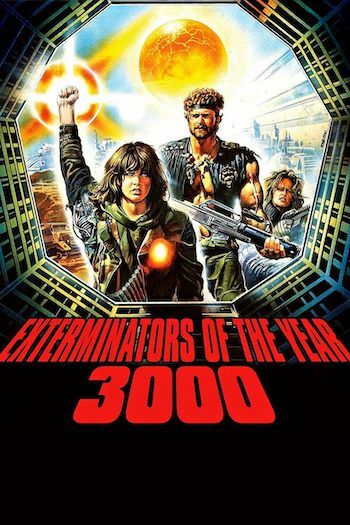 Indeed, it is hard to argue that Exterminators of the Year 3000 doesn’t owe its existence to Mad Max by way of Enzo Castellari‘s The New Barbarians. But they didn’t have Jo-Jo the Hamster! And those two leatherpocalypse classics didn’t have mutants with melted faces dressed in garbage bags and with what can only be described as foam buckets over their heads! And even the Italian The New Barbarians never had Pag from Yor, The Hunter From The Future! And I know that it never had any kid getting all drunked up on beer while Pag (here called Papillon) tried to repair his bionic arm! With movies though, context is everything and none of the above would matter a lick if it wasn’t serving a story worth those events. The story here is that the “ozone belt” has been blasted away by a nuclear war, leaving the earth a scorched wasteland where nothing grows and water is the most precious commodity of all! Roving gangs of toughs will stop at nothing to attain it, while good citizens have to hide in caves, trying to grow plants and making periodic forays into the teeth of the barbarians to get water to survive! We first meet Alien when he’s involved in a car chase with a pair of cops. He has also stolen Crazy Bull’s prize vehicle, the Eliminator. It’s a big, red two door, 1970s car that sort of looked like a Monte Carlo, but it’s tricked out with the Apocalypse Package. You know, metal blinds on the windshield and closed circuit TV inside to see out when the blinds are drawn! The desert waste lands being what they are, Alien ends up stealing the cop car to chase after someone who goes and steals the Eliminator that he has stolen from the evil Crazy Bull. 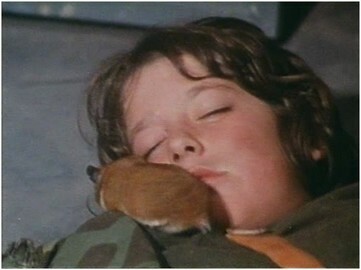 During the chase, he wrecks the cop car and is trapped underneath it for the next half hour until a little kid named Tommy and Jo-Jo the Hamster stumble upon him and rescue him. Tommy is all that is left of an expedition to find water and he and Alien strike up an uneasy alliance to find water (Tommy has a map to it) that sees Alien double cross Tommy and everyone he meets for almost the entire rest of the movie. 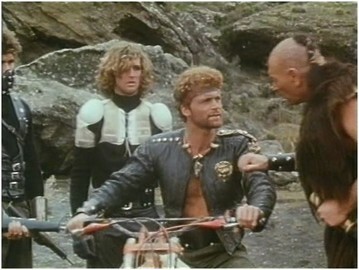 After Alien and Tommy are captured by Crazy Bull, Alien leaves Tommy in the lurch by telling Crazy Bull that Tommy knows where water is and then taking off on a motorcycle. Crazy Bull threatens Tommy for the information and to his credit Tommy proves to be a tough little bugger. When they try to break his arm, they find it unbreakable! Alien doesn’t really have the technical know-how to properly repair Tommy’s arm, so he duct tapes it up and they go off to find Papillon who is a mechanic and might be able to get it working again. Papillon fixes it and tricks it out just like one of the cars in the movie. Tommy’s new arm now can crush anything (like beer cans) and he can throw really far and with great accuracy. This comes in handy later when combined with Papillon’s stash of dynamite. Alien also runs into his old gal pal Trash and the Eliminator. Turns out she stole it from him. Alien spends the rest of the movie complaining about how she’s a no good thief who can’t be trusted while at the same time developing amnesia that he had stolen the car himself in the first place! The rest of the movie involves Trash and Alien dodging death traps and mutants at this facility where a bunch of water is kept. It all comes to an explosive finale when a mutant sets a self-destruct timer on the facility and we cut to a model of the facility. Alien, Trash, and Tommy look on in disbelief as their hopes for water disappear in a fiery blast of tiny chunks of balsa wood. Then Trash notices tears on Alien’s face. Could it be? The Alien who lives only for himself and cares nothing about the future has been moved to tears? Hah! It’s more likely that the explosion magically recreated the Earth’s atmosphere and caused it to start raining! And that’s exactly what happened! Once again, the Italians manage to destroy the Earth and save it with equal parts implausibility (why does the end of the world mean metal studs and leather headbands?) and entertainment (you will love the metal studs and leather headbands!). The only down side was the lack of screen time for Jo-Jo the Hamster. The way he crawled all over Tommy when Tommy was passed out drunk was very moving.